Like many of you, at this stage in my life I have a lot on the go. Work, school, life… Simply put, I have a bunch of stuff on my plate, and they’re all competing for attention. As a result, I found myself walking around in my life caught up in my own thoughts, being pretty much absent in my relationship with myself and those around me, fretting about not having enough time, the things I needed to do, the places I had to be and just feeling plain exhausted, uninspired and like a bit of a jerk. 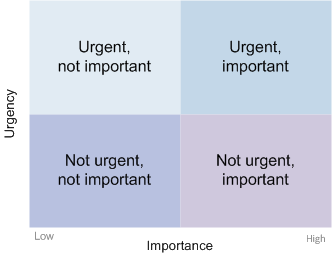 Reaching into my past job-training experiences, I mentally dialed up the traditional priority-setting tool: an urgent/ important charty thingy. End Result: Everything was Urgent AND Important. Wait…what? This was not covered in the training. So what’s a gal to do? Immediate thought: Lie in bed and binge watch Gilmore Girls on Netflix. Next thought: You’ve tried that already this week…Sounds like your priority-setting method needs a tune-up. So I did sit in my bed, but instead of turning on Netflix and tuning out, I went back to square one: I thought about what my real priorities were outside of that pesky to-do list. I had long been prioritizing myself and my own expansion, but I recently came into a new formula (more on this later). What can I do right now that gets me to my purpose: To feel Still. Full. Radiant. Those words are my compass. They move me in indescribable ways. In the morning when I’m setting out my “must completes”, I use them as a reference point for my top priority: My relationship with myself and the world around me. And at the end of the day, I check in with them and express gratitude to myself for the thoughts and actions I’ve taken that support their realization. Equally so, I take a brief minute to acknowledge the places where it was tough-going and shine a little love and light. And then I go to sleep and get up the next day and do it all over again- consistently. So that’s been the plan. It’s a small piece of my own journey to free up time, money, and space (of the mental, emotional and spiritual persuasion). It’s only been a short while, and I’m feeling lighter because of it. How do you set priorities? Does it work for you? I’d love to hear about your experiences. Hey- did you enjoy this piece? Share it with the buttons below!